Although I’m a big fan of Blackadder, and have an abiding “professional” interest in period comedies, I wasn’t in any great hurry to watch Ben Elton’s new Shakespearean sitcom Upstart Crow, because I haven’t really enjoyed anything he’s written since Blackadder Goes Forth, way back in 1989! * Nonetheless, I’ve seen the first two episodes now, and found myself laughing a lot more than I thought I would. Some of the faux-old-timey language is a bit too twiddly and distracting, and I could do without the long-distance-carriage-rides-as-analogue-to-modern-day-train-commutes runner… it’s also a shame that Shakespeare himself should be played by a Cambridge graduate (David Mitchell), thus undermining his status as a (relatively) “working class hero”, and adding a rather unfortunate layer of irony to the character’s impassioned railing against the oppressive Oxbridge establishment… but overall, it’s a pretty entertaining way to pass a spare half-hour. One big point in its favour is the inclusion of Gemma Whelan as ‘Kate’, the servile daughter of Shakespeare’s London landlord, who harbours a burning ambition to become an actress… despite the constant derision she faces for daring to suggest that girls might be better at playing female characters than boys-dressed-as-girls are! 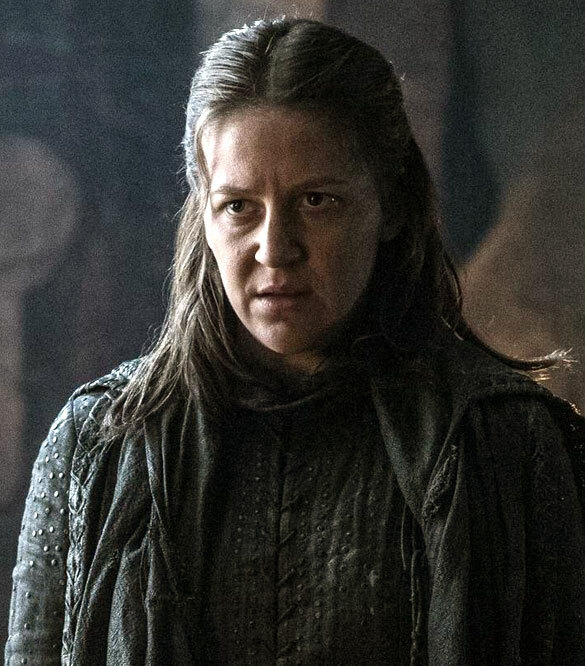 To be honest, I didn’t actually recognise Whelan the first time I watched the show… and even after I knew it was her, I still had a hard time seeing her as the same actress who plays the grim and grubby ‘Yara’ in Game of Thrones. I’m really enjoying her sweet comedic performance in this show, which provides a bracing contrast to her saltier dramatic work in GoT… and there can’t be many actresses who get to demonstrate their range so strikingly in two concurrent series, so snaps to her for that! * Which was co-written with Richard Curtis, of course… and anyone who’s watched the Blackadder box-set’s behind-the-scenes featurette will know that the scripts for that series were painstakingly punched-up and polished by the cast, before being committed to video-tape. This entry was posted in Rants about TV and tagged Blackadder, Game of Thrones, Gemma Whelan, Upstart Crow. Bookmark the permalink.